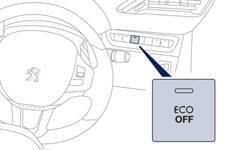 - with an electronic gearbox , at speeds below 5 mph (8 km/h), when you press the brake pedal or you put the gear lever into position N .
You can deactivate the system at any time by pressing the "ECO OFF" button; the button's warning lamp comes on. The system is automatically reactivated every time the engine is started with the key. Before refuelling or doing anything under the bonnet, you must switch off the ignition with the key.